The SourceView Bible now offers readers the first major formatting innovation of the biblical text since the introduction of verses during the Reformation—nearly five hundred years ago. This breakthrough layout highlights the dramatic character of the scriptures in four colors and a new index system that reads like a movie script, greatly enhancing the reader’s ability to understand the story. Ideal for small group Bible study and family settings, readers can pick one of the four colors to read aloud together. This is a powerful way to engage God’s word in community. Download the sample of Jonah today! The full Bible will be out near Easter of 2012! I love the screenplay style presentation of the scripture that SourceView Bible is now bringing to iBooks. The color coded text lets you clearly see which character is speaking and allows groups to read together in an interactive way. This is NOT another translation - it's a whole new way to see the word of God. Can't wait to get the full SourceView Bible on my iPhone and iPad. Great analogy of God, and His extreme love for mankind. This illustration opened my eyes and caused me to make a mental comparison between Jonah and myself; unfortunately there are more similarities than differences. Lord help me to be more like you. The SourceView Bible has made scripture come alive for me in a fresh way. 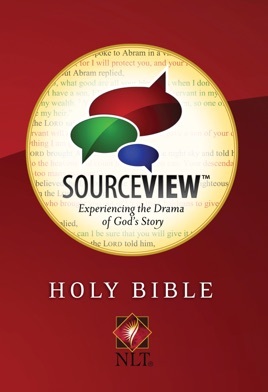 For the first time reading the SourceView Bible I felt like I was literally involved in the story the story rather than being an outside observer. The characters came alive and popped off the page in 3D. My favorite Bible to read alone or even better in a small group.